Distribution: Southern New South Wales, Victoria, Tasmania and eastern South Australia in wet areas. lanigerum...from Latin laniger, wooly, referring to the hairy leaves. 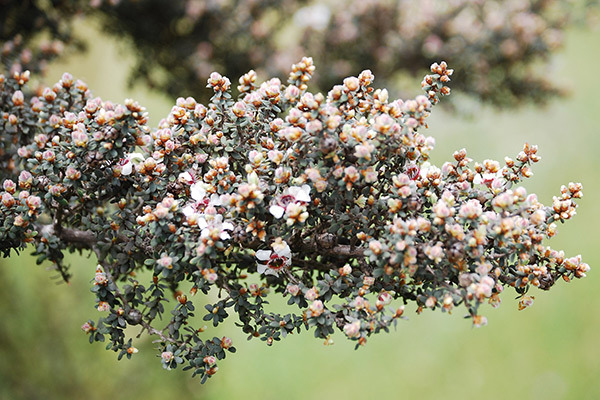 Leptospermum is a genus of about 83 species, all but three occurring in Australia. They are commonly known as 'tea trees' due to the practice of early European settlers of using the leaves of some species as a tea substitute. Photo: "Cs california" - from Wikimedia Commons and reproduced under the Creative Commons Attribution-Share Alike 3.0 Unported license. Leptospermum lanigerum is usually a medium shrub to about 3 metres although it can reach up to 18 metres in Tasmania as a tall, thin tree. Leaves may be grey-green to dark green with dense, small hairs and are generally oval-shaped to around 12 mm long. The white, 5-petalled flowers are fairly typical of the genus being circular (about 15 mm diameter) with numerous small stamens surrounding the central stigma. Flowers are followed by small, woody fruits containing many seeds; the fruits remain unopened until they are removed from the plant or the plant dies. L.lanigerum is reasonably common in cultivation. The the shrubby forms with silvery foliage and those with a pendulous habit of growth are attractive garden plants. It is hardy in moist soils in a range of climates. Plants prefer full sun or partial shade and may be pruned severely if necessary. Propagation is easy from both seed and cuttings although it is reported that seed of the Tasmanian form may be slow to germinate.